This rainbow splatter might not look like the beautiful images of galaxies you’re used to seeing, but it’s actually rather special. It’s the highest angular resolution astronomical image ever captured, and it shows a jet of matter erupting out of a black hole 900 million light years away. 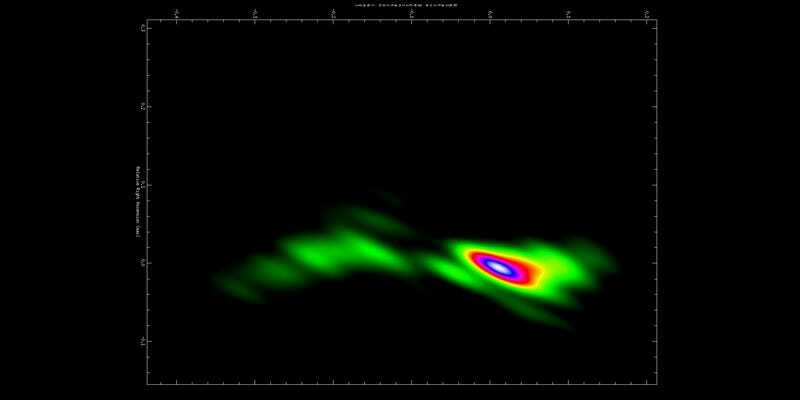 The image shows the a jet emerging from the black hole known as BL Lacertae, captured at a wavelength of 22GHz. And boy did it take some effort to capture: It’s based on data acquired by 15 separate radio telescopes here on Earth. The sensing ability of that joint effort provided what the researchers call a “projected baseline distance”—the effective field over which data is collected—of 7.9 Earth diameters in length, or 62,000 miles. That distance allowed the team to create a highly detailed image of the black hole’s jet, with an angular resolution—that’s the angle between parts of an image, measured from the point of observation, between which its possible to between distinguish small details—of 21 micro arc seconds. Or, in (slightly) more comprehensible terms, 0.000000006 degrees. The work is published in The Astrophysical Journal. The jet itself measures a couple of hundred billion miles in length. But, as Popular Science points out “because we’re so far away from the jet, the resulting image is equivalent to looking up at the moon from Earth and being able to see a half-dollar coin on the surface.” So, pretty impressive then.